Last month, Corrections Corporation of America promoted Kim White, an African-American woman, as their Vice President, Correctional Programs Division. She formerly served as Managing Director, Inmate Programs and served more than 25 years with the Federal Bureau of Prisons (BOP). 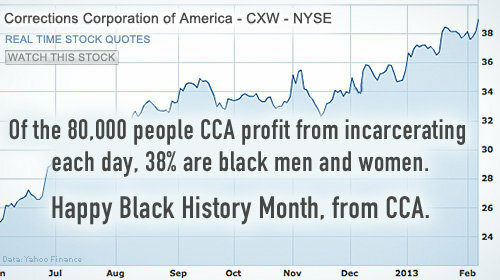 After seeing posts about the manner in which CCA decided to celebrate Black History Month in February, I’m hoping her presence will slow down CCA’s efforts on doing such a thing again. Image featured on ACLU's Feb. 8 blog. If you weren’t made privy to the campaign I'm speaking of, let me update you. CCA celebrated Black History Month with blog posts remembering Rosa Parks and posted Facebook trivia contests about the contributions of African-American musicians. Evidently, CCA must have forgotten that they are the largest private corrections company in the United States and manage more than 60 facilities with a designed capacity of 90,000 beds. How ironic is it that this company, celebrating Black History Month, is making $1.7 billion annually off of the incarceration of people of color? The concept of privately-owned companies making profit from incarcerating human beings is absurd to begin with. It incarcerates more African Americans than any other private prison company. It spends millions of dollars on lobbying and campaign contributions to ensure their facilities stay full. Overall according to NAACP Criminal Justice Fact Sheet, African Americans now constitute nearly 1 million of the total 2.3 million incarcerated populations nationwide- federal, state, and private. African Americans represent 26% of juvenile arrests, 44% of youth who are detained, 46% of the youth who are judicially waived to criminal court, and 58% of the youth admitted to state prisons. Also one in six black men has been incarcerated as of 2001. If current trends continue, one in three black males born today can expect to spend time in prison during his lifetime. In some states, like Illinois, African Americans are eight times more likely to be incarcerated for a petty drug offense than white people, even though African Americans and white people consume and distribute drugs at similar rates, according to the Illinois Disproportionate Justice Impact Study Commission. So why exactly did CCA decide it was appropriate to acknowledge this special month for African Americans when they are living off incarcerated people - the majority of which are African American? Maybe it was meant to be a sincere gesture but it is seen more as a mockery. It was not a general “Happy Black History Month.” The President and CEO of CCA, Damon Hininger, wrote on his blog post “We can honor Dr. King’s legacy by embracing his dream of equality for all people-regardless of race, creed, or color. We can also make a decision to be of service-to take actions that improve our communities and ultimately, our society.” First, there is no promotion for equality for all people in prisons. Today people of color continue to be disproportionately incarcerated, policed, and sentenced to death at significantly higher rates than their white counterparts. According to a March American Progress article, Top 10 Most Startling Facts about People of Color and Criminal Justice in the United States, people of color make up about 30 percent of the United States’ population, but account for 60 percent of those imprisoned. Also, African-American youth have higher rates of juvenile incarceration and are more likely to be sentenced to adult prison. African-American women are three times more likely than white women to be incarcerated. This article also touches up on the fact that once convicted, black offenders receive longer sentences compared to white offenders. The U.S. Sentencing Commission stated that in the federal system black offenders receive sentences that are 10 percent longer than white offenders for the same crimes. Regarding Hininger’s comment on improvement, how could this be possible if prisons nowadays are more focused on punishments rather than its initial purpose which is rehabilitate? Hininger also states in his blog post “what a great reminder of how far we've come as a society and as a country.” There are more African Americans in prison today than there were African Americans enslaved in 1850. Have we really come that far? Seems like private prison corporations have only found a new way of captivity. If the horrific statistics of the rate African Americans are incarcerated and their representation in prisons is considered “equal” to Hininger compared to white people, then he has a lot of observance and reading to do before he makes a comment, especially regarding Black History Month. Hopefully, White will help prevent an incident like this from happening again. Tosin is JPI's communications intern. Do you remember the Central Park Five?